Of course, that raises an important question – what is the most interesting gull in the world? We tossed this idea around on Facebook for a while and came to few conclusions. My first instinct was that the rarest gull would rank high on the ‘most interesting’ scale, but that’s a lister’s instinct – a sort of stamp-collecting bias, at best. 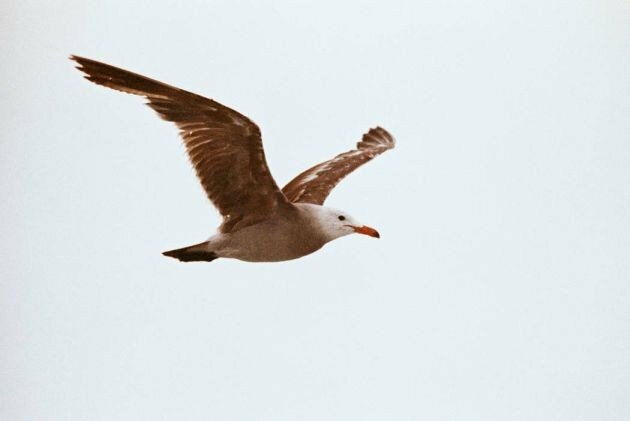 Donna Schulman countered with a very cogent observation – while in the Galapagos, she saw people forsake the terrifically rare but only somewhat pretty Lava Gull to get photographs of the more common but far more visually appealing Swallow-tailed Gull. Aesthetic charm is probably a big part of making a bird interesting to outsiders, and unfortunately most gulls fall fairly short in both form and voice. Not all, though. Consider the Ivory Gull. Sure, it makes the birder’s heart race for its sheer listing value, but is it not kind of pretty too? Small and white and rounded and basicly cute, could it not be the Turtle Dove to the rest of the Laridae‘s Rock Pigeons? If you would kindly ignore the fact that it eats putrid, bloating seals, it’s adorable. For that matter, what about the Ross’s Gull? It’s pink. Pink! Sometimes. A little bit. But cute is not the same as interesting, as a brief survey of OKCupid will tell you just as well as birds can. Interesting implies something a little more punk-rock. The Swallow-tailed Gull aforementioned has that edgy look, with its red eye-liner and eccentric bill. So does the Heermann’s Gull, which looks like it has stolen someone else’s head. And what about lifestyle? Gulls are generalists, as a group, and unfortunately that does not get a lot of respect from humans, even though we’re the greatest generalists of all. Anything that can live off our garbage gets denigrated, when probably we owe it thanks for cleaning up after us. Still, those Ivory Gulls surviving off those putrid seals are tough cookies. So are the tiny Kittiwakes that dance over the waves for leagues. So, for that matter, are the Ring-billed Gulls of Staten Island, considering that they haven’t all died of cancer yet. But you can’t force people to find Staten Island interesting in any regard. What say you? What is the most interesting gull in the world? A change in its range, like the one that Lesser Black-backed Gulls seem to be undergoing, might make a gull interesting. I don’t know if they count as interesting under any criteria, but my favorite gulls are Laughing Gulls. I do like Laughing Gulls myself. I associate them with Coney Island, the Mermaid Parade and eating clam strips at dubious boardwalk dining establishments. I’ve grown to love Bonaparte’s Gulls. After seeing them next to Great Black-backed Gulls, I realized how delicate and tiny they were. I think one of the more beautiful gulls would have to be a breeding-plumaged Sabine’s, though! Saunders’s Gull gets my vote for an interesting gull..
How can the bird with “hyperboreas” in its scientific name be overlooked? Glaucous Gulls are amazing! Familiarity breeds contempt. If gulls were as rare and hard to see as birds of paradise we’d realise how attractive they actually are. Swallow-tailed or Ivory Gull, with my vote going to Swallow-tailed. Stunningly gorgeous bird and only nocturnal gull trumps Ivory; Seeing one flying in and out of the lights of the cruise ship with the Milky Way above may be my favorite birding moment. Sabine’s Gull should also get a mention. How about Gray Gull, which nests in one of the driest places on the planet, requiring adults to travel up to 120 miles a day for food and demanding specialized eggshells? Little Gull. No need to discuss this any longer. You all make excellent cases. I’m leaning towards David’s Gray Gull now, but if we go that route I think I need to give a tip of the hat to the Andean Gull as well. I might have to recuse myself from the Swallow-tailed Gull discussion, though. I once wrote a horror story about nocturnal gulls, so I might be accused of bias. There are few gulls as elegant at Sabine’s Gull. While the idea of Gray Gull is great (though I haven’t seen it) and Swallow-tailed Gull looks spectacular (and, heck, the name gives it panache), I just don’t see how you can do better than Sabine’s Gull. That species combines so many facets that make birds “interesting!” It breeds in the Arctic. It is a long-distance migrant. It is pelagic. It could, literally, show up nearly anywhere, enlivening some birder’s day. It is quite attractive. It is distinctive, even in juvenile plumage! Pacific Gull of southern Australia with its thick massive bill is pretty cool.